Special Containment Procedures: SCP-402 is kept in a climate-controlled storage locker at Site-41. All known SCP-402-A and all water affected by it (currently ~612,000 liters) are kept in a climate-controlled freezer at Site-41, with each sample wrapped in barricade tape to prevent accidents. SCP-402 and SCP-402-A must be kept away from all water, including water vapor, outside of testing. Substantial quantities of SCP-402-A may exist outside of containment. All unusual drowning or suffocation deaths must be investigated for possible SCP-402 involvement. Mobile Task Force Tau-4 "Water, Water, Everywhere" is tasked with performing all testing, investigations, and retrieval missions associated with SCP-402. SCP-402-1 is kept in a Type 2 Humanoid Containment Cell at Site-59. Description: SCP-402 is an irregularly-shaped solid weighing 4kg. 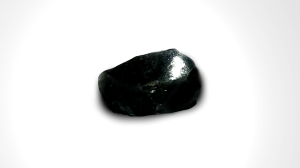 While SCP-402 is composed largely of obsidian, trace amounts of platinum and iridium are present. SCP-402's structure has numerous abnormal microscopic gaps similar to those found in SCP-148; this, along with SCP-402's anomalous density (22.2g/cm3, roughly 8.5 times that of obsidian), suggests that the two materials operate under similar principles. Any water that comes in contact with SCP-402 (hereby SCP-402-A) develops antimemetic properties, effectively rendering it imperceptible by any direct means. Witnesses typically interpret this as SCP-402 absorbing the water. SCP-402-A can be detected through its interaction with other materials, which occurs normally. For example, the dissolution of salt in SCP-402-A presents as the disappearance of the salt. Scales and thermometers that detect SCP-402-A's weight and temperature, respectively, can be read normally. Items that float in water will appear to levitate when placed in SCP-402-A. Water rendered imperceptible by SCP-402 can transfer its effects to other water — for every unit of SCP-402-A that is introduced to a body of water, an adjacent 11,000 units (± 500) are similarly effected. This is perceived as the rapid, spontaneous disappearance of the affected water. SCP-402-A does not present any risk of a chain reaction; however, due to natural currents, SCP-402 itself can create large amounts of antimemetic water very quickly when submerged, particularly in moving water. Consumption of SCP-402-A presents a serious choking hazard, as its presence in the trachea does not trigger the laryngospasm responsible for sealing the airway. SCP-402-A's presence in the lungs is only detectable via the resultant oxygen deprivation, and is typically mistaken for other medical conditions, which prevents proper treatment. Safe handling of SCP-402-A can only be performed by trained personnel. SCP-402-1 is a human, roughly 35 years of age, that was in possession of SCP-402 at time of recovery in ██████, Indonesia, as well as a plastic jug containing four liters of SCP-402-A. SCP-402-1 has refused to cooperate or communicate with Foundation personnel, and has not been identified. Prior to containment, SCP-402-1 would consume SCP-402-A to the exclusion of all other liquids,1 resulting in the illusion that it did not possess any body fluids and giving it a desiccated appearance. This was initially mistaken for a property of SCP-402-1 itself, with the true nature of its condition (and the anomalous nature of SCP-402) only being identified after careful observation. SCP-402-1's appearance returned to normal as SCP-402-A was flushed from its system. SCP-402-1's blood, when composed of SCP-402-A, possesses cognitohazardous effects when consumed in any quantity. Subjects will become convinced that any water they encounter is an extension of an effectively infinite subterranean body of water, in which they risk being trapped should they come into contact with the water. This results in severe aquaphobia, as well as a fear of drowning that persists even in situations where no water is present. Testing the anomalous properties of SCP-402-1's blood has been deemed cost-ineffective; as such, information on its effects have largely been garnered from SCP-402-1's pre-containment activities. Note: Several subjects who had previously consumed SCP-402-1's blood displayed a strong fear response when exposed to SCP-109 and SCP-812, though none were able to justify their reactions. Further testing is under consideration. 1. This was accomplished safely via a tube inserted into the esophagus.